If your familiar with QlikView and move to the new Qlik Sense tool you’ll see a lot of similarities. The script, expression writing are the same. The QMC is very different. One of the main differences is who will be using it. Typically the QMC in QlikView was only used by the developer team. In Qlik Sense however you need to move away from that concept and towards a world where many more people, the people who use the reports have some access to the QMC. A developer will extract and transform the data, set up data models, create Sense applications and create standard expressions, dimensions and visualisations in the Master Items. User will then consume that information and super users will want to develop the applications further, adding new data and visualisations. They will want to publish the revised dashboards so others can consume that information. Hopefully you are already aware of the concept of Resource Streams. They can be thought of as folders on the Qlik Sense Hub where applications can be stored. 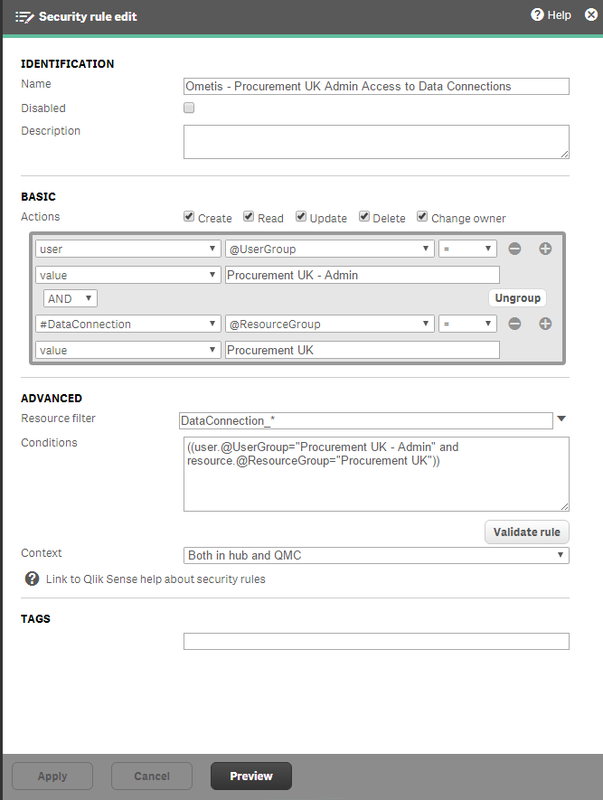 Users can be granted access to those streams using security rules in the Qlik Sense QMC. These are all Hub rules! Rules can also be created to control who can do which actions on the QMC. Again you may already be aware of the standard roles; Root Admin, Content Admin, etc. These roles that allow a user access to certain areas of the QMC although these roles are for everything. If you’re a Content Admin you can Publish, Delete, Edit any Application, Reload Task, Data Connection resource for any stream. That’s fine if you’re sticking with the traditional BI structure of a central development team. If not you’ll have to create the right rules for your business. Security Roles can only grant access, they can’t take access away! When you install Qlik Sense server you’ll have quite a large number of automatically defined rules. Most of which you’ll keep and some you’ll have to edit or disable. The reason I have so many rules is because you can’t just do an Admin rule, each resource has its own set of permission types; Create, Read, Update, Delete, Export, etc. and you have to define them individually. The resource filter is DataConnections_* which defines the area of access. You can have multiple resource filters separated by a comma although in testing this doesn’t always work as expected, if in doubt split them out! I hope you find this useful. If you have some hints or ideas please comment them below!